Here is the petition for today. Please feel free to print it off and get your friends, collegues and family to sign it, especially if they can’t make it to the vigil today on Victoria Island. Remember to bring copies with you; they will be prayed over and smudged by an Elder before presenting them to the Minister. The burden of this experience has been on your shoulders for far too long. The burden is properly ours as a government, and as a country. There is no place in Canada for the attitudes that inspired the Indian residential schools system to ever again prevail. You have been working on recovering from this experience for a long time and in a very real sense, we are now joining you on this journey. Unfortunately, the “burden of this experience” has not yet been shared. We, the undersigned, believe that it is time to fully live up to the promises in the federal government’s apology for Indian Residential Schools. We believe it is time to accept the responsibility for our shared history and work to uncover the complete history of Canada’sresidential schools. We believe it is time for us all to face what happened during one of themost violent policies in this country’s history. We believe it is time to take a journey of honesty together. We demand that the federal government, without any further delay or conditions, release all documents pertaining to Indian Residential Schools to the Truth and Reconciliation Commission of Canada immediately. We also demand that the federal government commission a national inquiry into the biomedical experiments performed by government officials on First Nations communities in order to fully inform the public on the extent on this project and investigate the legacies of its impact. 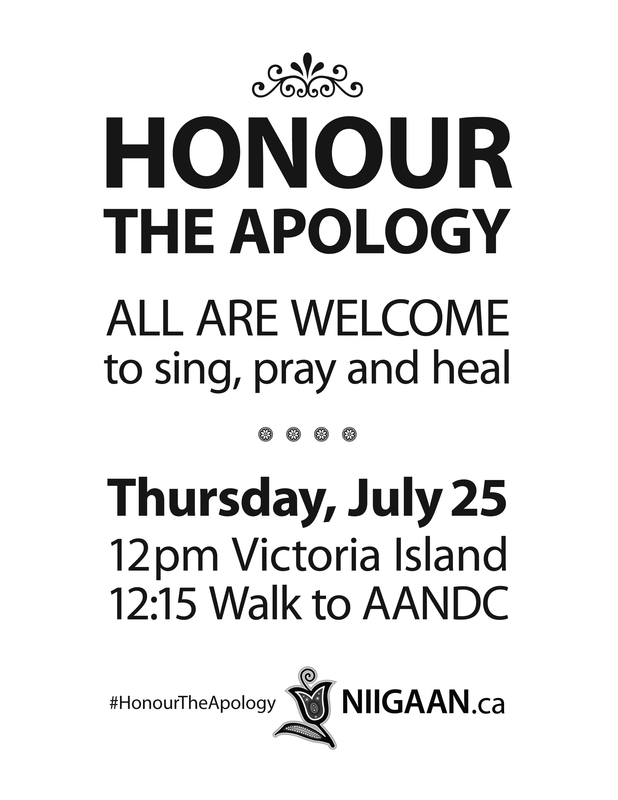 On Thursday, July 25, we join together with Canadians, newcomers, and Indigenous peoples from all walks of life in reflecting upon and taking action to respect Canada’sapology for the Indian Residential School System. We ask that the federal government ofthis country take these first steps towards reconciliation and join us. Honour the Apology: Call for Volunteers!